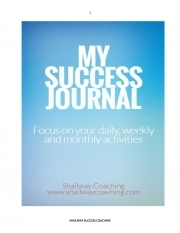 Description of "My Success Journal (eBook)"
To keep you focused in the important activities of your life this journal will help you to plan your activities on weekly basis and find out what is working, what is not working. This book consists of daily, weekly, monthly questions, answering to which you will be able to focus on what is important in your life. Reviews of "My Success Journal (eBook)"